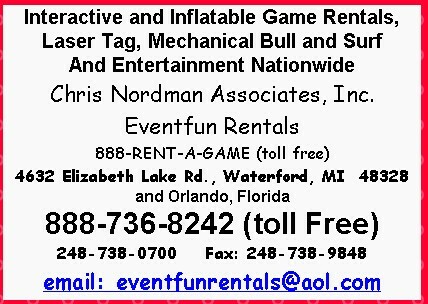 Chris Nordman Associates, Inc., also know as EVENTFUN RENTALS, provideS interactive and inflatable game rentals and entertainment production services Nationwide. 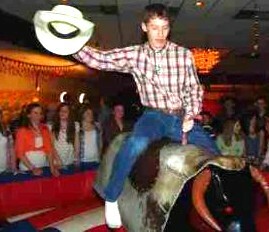 We feature Mechanical Bulls, Mobile Laser Tag, Casino Equipment, Carnival Games, Rockwalls, Obstacle Courses, Kids Rides, Moonwalks, Trackless Trains, and much more. Over 30 years experience. 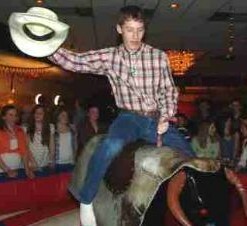 Fully Insured and Licensed. Proud Members of IIPGA, NACA, AFM, and MFEA. About: We have been in the event and entertainment business for over 25 years. We have been in the event and entertainment business for over 25 years..
We have been in the event and entertainment business for over 25 years. We have anything you want at VERY competitive prices!